Just before the Chinese New Year holidays last week, I had the opportunity to dine in this really cosy Aria Restaurant offering Italian cuisine. Located in Bukit Damansara, Aria introduces itself as a neighbourhood restaurant offering a warm and intimate setting for delighting in good food with family and friends. Arriving at Aria Restaurant around 7pm, we were greeted by the owner, who with a warm welcome brought us around the restaurant while introducing to us the signature dishes which they offered in their menu. I found the restaurant to be really homely, which was exactly what Aria Restaurant wanted to portray, a place for families and friends to unwind and relax. The interior did remind me of home, with the sofas and all. With a capacity of 40 seating downstairs and 30 seating upstairs, Aria does make a good hosting whether it's for a weekday dinner, Sunday brunch, gatherings with family and friends of small business meetings. Fully air conditioned, comfortable would be an understatement. Aria Restaurant do provide a special lunch menu which includes a salad bar buffet for RM12.90+ for the lunch crowd. We were there to sample their dinner menu though, so do check out what we had that night as below. The first dish that came out was the Lamb Kebab which was moist enough to fully savor the lamb meat to be taken with Aria's special Spicy Mint Sauce. The Antipasto De La Casa which arrived next though was a huge platter of starter dishes consisting of salmon, beef carpaccio, mushroom bruschetta, marinated portobello, fried calamari and a whole lot more. If it wasn't shared between the bunch of us, I would have been full just after having this dish. The Aglio-olio Smoke Duck Pasta was suitable for my palette, something which I found was good since the last few duck meat I've taken elsewhere weren't as good. Aria Restaurant managed to cook the duck meat in a way that the strong duck meat odor wasn't too overwhelming. I found the Tonnarelli Di Aria dish really unique, as not many restaurants provide black spaghetti which was really nicely done, infused with squid's ink. Together with the giant scallop meat, tiger prawns, mussels, and mushroom, this dish makes for a delightful seafood meal. My favourite dish for the night would be this Prime Ribs. Seasoned with spices and salt, and served with a choice of garlic rosemary, black pepper or brown sauce, I just couldn't get enough of it. The meat portion was really large and juicy. It was pretty nice that Janice do not take beef, so I could have her share as well. Another unique dish would be the Merluzzo Canadese Atlantico which was basically the canadian cod fish on a plate. As far as I know, the Cod Fish doesn't come cheap, and has to be prepared while its really fresh or risk the fish turning jelly like and stick together. The cod fish flakes from Aria Restaurant could be separated just by a flick of the fork, which was pretty cool. We ended the night with some sinfully sweet desserts in the form of the Apple Strudel and Chocolate Volcano. No matter which restaurant I'm in, I always look out for their "volcano" dessert as I am absolutely in love with this dessert. The one in Aria Restaurant wasn't bad at all, with the warm chocolate trickling out just right upon cutting the cake. Overall, it was a good night out, we left the restaurant filled to the brim with good Italian based food. As quoted from the owner of Aria Restaurant "Growing up in a country renowned as a culinary paradise, Malaysians can discern good food from a young age. Food brings us together on various occasions, creating opporunities to build and strengthen bonds" which I agree whole heartedly. 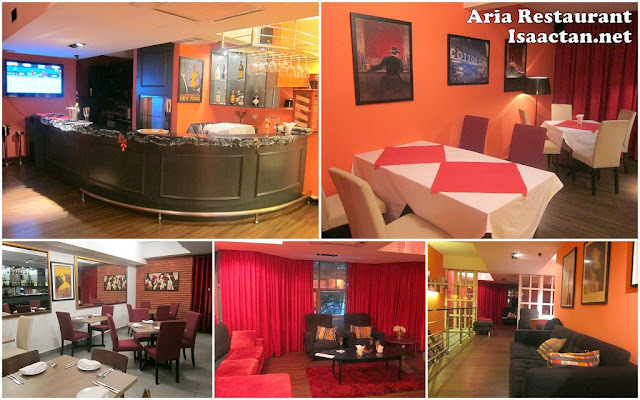 Do drop by Aria Restaurant should you be in the vicinity of Bukit Damansara and want some wholesome Italian food. wow, nice!! i just love italian food!! the interior looks very vibrant and colorful, sure can kick up your taste buds.. but then, kebab?? is kebab italian?? haha!! anyways, my choice would be the aglio-olio pasta with smoked duck, OMG, so delicious!! the prime ribs also not bad huh, but i always go well done, hahaha~~ that's the best test on how tender the meat will be even have it well done..
feels like home. so comfy. another nice italian restaurant.. good good ... I have not tried the squid ink spaghetti b4? nice? or is just taste like normal spaghetti? Good to see 'grass fed' on the menu! It looks pretty cosy too. Oooooo...food looks great! Bukit Damansara? That was where you sent me that day? Hah!!! Next time, you know the way liao...right? You can take me to eat here. Hehehehehehe!!!! P.S. Your treat, of course. LOL!!! wow nice restaurant, i like the interior with red colors! Wow! The food looks delicious! And I want that volcano! Haha! food's good in Aria. Did you check out their whisky selection? Over 80 to choose from. More extensive than many places but not as extensive as the Whisky Bar. the codfish is good in Aria :) i'd love to have some of the apple dessert too! volcano sounds great to me. I want to try it. it with the chocolate volcano. Aria seems like an enticing restaurant. I like the ambiance of this place. They also have lots of good looking restaurant furniture. I think I should try visiting the place soon.